Two days after admitting that he did not yet have “a complete strategy” for dealing with the ISIS terrorists estimated as an army of 30,000, President Obama has dispatched another 450 U.S. advisers to train Iraqis troops to do the fighting. It appears that trainers will outnumber trainees. There will be a total of 3,500 American trainers, about 950 more than Iraqi troops. Ben Rhodes, deputy national security adviser, said the modest troop increase came as a result of “a very regular process of evaluation” not from any perceived public pressure to do something, after a long string of ISIS advances. We are told by military sources that what is needed are Special Forces to provide intelligence and spotters to direct American aircraft. The lack of on-the-ground information and a restrained target approval process related to White House rules of engagement, 75% of all allied air attacks now return without dropping their ordnance. To us he says that no one prepared him for becoming a “two-war president” but reality supplied him with a lot of challenges in the White House. He says he had to make very difficult decisions — sending boys to defend the homeland with the knowledge that not all of them would return. Q: You mentioned ISIS, you spoke about defeating terror. Is it possible to defeat ISIS in Syria and Iraq without boots on the ground? This has already translated into the idea that Mr. Bush said we needed boots on the ground. He said that was up to the president. When it was his job to decide his position was that you needed boots on the ground. In my post-presidency I have written a book, and that has helped a lot. I wrote another book. It is brand new. It is about an extraordinary man — my father. It will be a very historical document because never has a son of a president written about the president. So the paintings are along these lines. There is so much in the interview that is charmingly Bush, that I wanted to include it all. You will have to read it for yourself. The United States knew that ISIS was planning an offensive strike on Ramadi, the strategic city in Iraq’s Anbar Province. Bloomberg’s Eli Lake reported that the U.S. had significant intelligence about the offensive, even as it was happening. The U.S. watched ISIS fighters, vehicles and heavy equipment gather on the outskirts of Ramadi before the group retook the city in mid May. Bloomberg quoted Ari Force Lt. General David Deptula (ret,) who planned and executed major operations in Iraq and Afghanistan that restrictive rules of engagement for American pilots was part of the problem. Pilots flying sorties in Iraq “have to call back and ask, ‘mother may I’ before they can engage,” said the retired general, who was the first deputy chief of staff for the Air Force for intelligence, surveillance, and reconnaissance. Genieve David, a spokeswoman for U.S. Central Command, acknowledged that the U.S. employs a “dynamic targeting process” in Iraq and Syria, with a focus on limiting civilian casualties and collateral damage. According to Lt. Gen. Deptula, the restrictive rules of engagement are benefiting the enemy. Another major setback in the battle for Ramadi was the Iraqi military abandoning their positions, and not having enough weapons and ammunition. As well, U.S Special Operation forces were not authorized to accompany Iraqi troops in battle. Toby Harnden, Washington Bureau Chief of the Sunday Times, writes of the Mad Max, post Apocalyptic scenes as a “hulking bulldozer emerged through a swirling sandstorm, with a suicide bomber at the wheel and armored plates welded to its chassis, the vehicle crashed through concrete blast barriers surrounding the Iraqi police headquarters.” Then its explosive load was detonated. Waves of fortified dump trucks and souped-up Humvees followed as ISIS fighters fanned out across Ramadi. There were estimated to be about 30 vehicle-borne suicide bombs that ripped through Ramadi. About 10 of them were estimated to be the size of the Oklahoma City Bomb which killed 168 Americans twenty years ago. President Obama has apparently given up on the Iraqi military because they ran away. If they won’t stand up and fight, Obama won’t support them. It takes a lot of training and good equipment to stand up to 30 suicide bombers driving dump trucks loaded with explosives and ISIS fighters swarming through the city killing everyone on sight. Obama has had major problems before with restrictive rules of engagement that get American troops killed. As a man of the Left, Obama sees the United States historically as having exerted a malign influence on the outside world. Greedy corporations, an overly powerful military-industrial complex, a yahoo nationalism, engrained racism, and cultural imperialism combined to render America, on balance, a force for evil. Several assumptions underlie this approach: The U.S. government morally must compensate for its prior errors. Smiling at hostile states will inspire them to reciprocate. Using force creates more problems than it solves. Sorry, I don’t believe that smiling at Iran will change its aims in any way. When they chant “Death to America,” I believe they not only mean it, but expect to carry it out. ISIS has captured the ancient city of Palmyra, and has put the 2,000 year old Roman Amphitheater back into use as a site for executions as entertainment .Barbarians. The Washington Post on Wednesday carried answers to written questions from reporter Liz Sly while he was attending the annual Sulaimani Forum, a get- together of Iraqi leaders, thinkers and academics, at the American University of Iraq in Sulaimani in northern Iraq’s Kurdistan region. He spoke of mistakes the Americans have made and mistakes the Iraqis themselves have made, the squandering of so much of what we had achieved, and the exploitation of those failures by extremists on both sides. Having said that, my sense is that the situation in Iraq today is, to repeat a phrase I used on the eve of the surge, hard but not hopeless. I believe that a reasonable outcome here is still achievable, although it will be up to all of us — Iraqis, Americans, leaders in the region and leaders of the coalition countries — to work together to achieve it. What has happened in Iraq is a tragedy — for the Iraqi people, for the region and for the entire world. It is tragic foremost because it didn’t have to turn out this way. The hard-earned progress of the Surge was sustained for over three years. What transpired after that, starting in late 2011, came about as a result of mistakes and misjudgments whose consequences were predictable. And there is plenty of blame to go around for that. Yet despite that history and the legacy it has left, I think Iraq and the coalition forces are making considerable progress against the Islamic State. In fact, I would argue that the foremost threat to Iraq’s long-term stability and the broader regional equilibrium is not the Islamic State; rather, it is Shiite militias, many backed by — and some guided by — Iran. The whole piece is to be found here. Do read the whole thing, it’s not long. The saga of Palmyra has not ended. ISIS militants have reportedly captured the ancient Syrian town of Palmyra on Wednesday as Syrian officials evacuated civilians and scrambled to keep priceless antiquities from falling into barbarian hands. Syrian activists said that Syrian soldiers were seen fleeing the area. Authorities have rushed to remove hundreds of statues to safe locations, Syria’s antiquities chief said. But Palmyra has a museum and large monuments that cannot be moved. 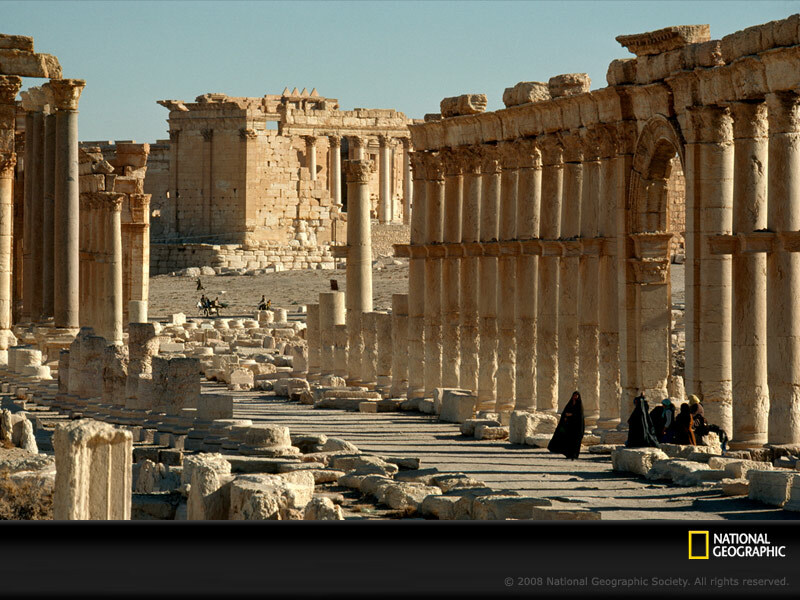 The city dates back to the Neolithic, it was first noticed as a caravan stop for travelers crossing the Syrian Desert. It is mentioned in the Hebrew Bible and in the annals of the Assyrian kings, and eventually the Roman Empire. 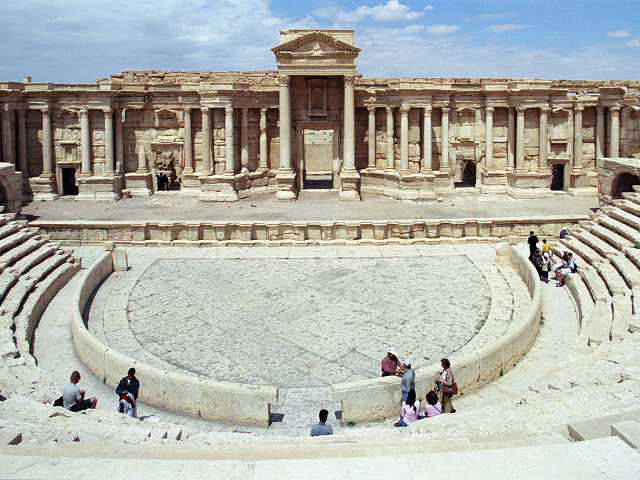 Given ISIS path of mindless destruction authorities are fearful for the Temple of Ba’al, an ancient theater and its famous colonnade. 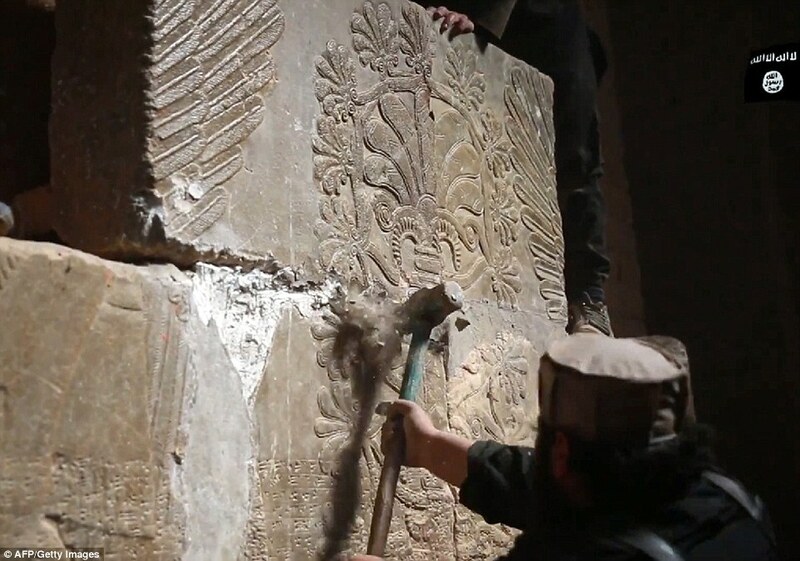 ISIS counts complete destruction of sites of of historic and religious importance. But there have been 50,000 people there who are being evacuated. Experts have also warned that militants have smuggled priceless artifacts out of the country for sale on the black market to fund the terrorists’ army. ISIS blew up and bulldozed Nimrud. Interesting that they revel in the destruction, yet recognize the value of the artifacts on the black market. It’s all right if others possess the evidence of past civilizations, they just don’t want any in their territory. 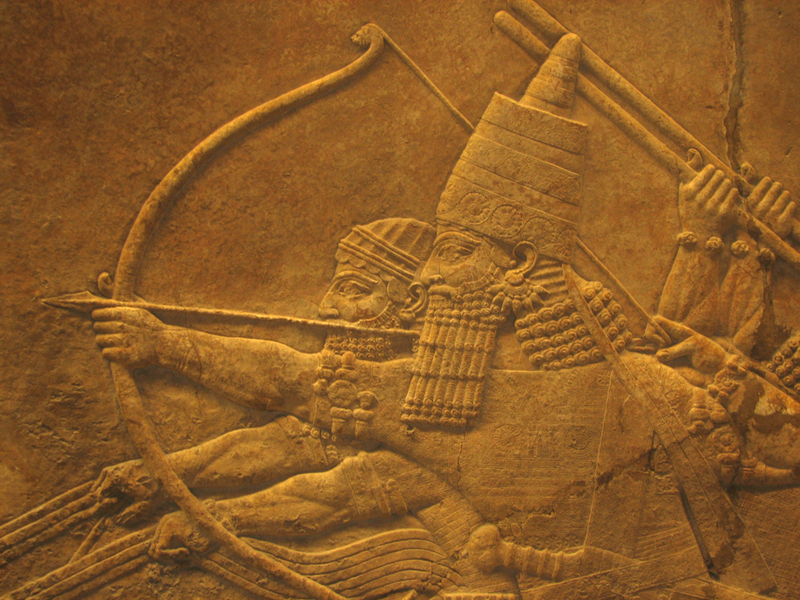 The Assyrians rose around 2,500 B.C. and at one time their realm stretched from the Mediterranean coast to present day Iran. They left behind palaces and temples decorated with huge reliefs depicting their king’s military campaigns and conquests and his great hunting prowess, killing lions and other dangerous animals. The city of Nimrud was founded in the 13th century B.C.during the reign of King Ashurnasirpal II, and served as the second capital of the Assyrian empire. Another capital was Ninevah. These colossal winged man-headed lions or bulls were protective deities put at the entrances of palaces and temples weighing about 10–30 tons each. the Washington Examiner lists the destruction, with an ISIS video bragging of their destruction and listing the other historical sites lost to the world because of ISIS wanton destruction, which seems remarkably pointless. The Crac des Chevaliers, an 11th Century Crusader castle, the Saint Simeon Church in Aleppo and the Aleppo Citadel. Jonah’s tomb, 173 priceless artifacts with statues from Hasra in the Mosul Museum. 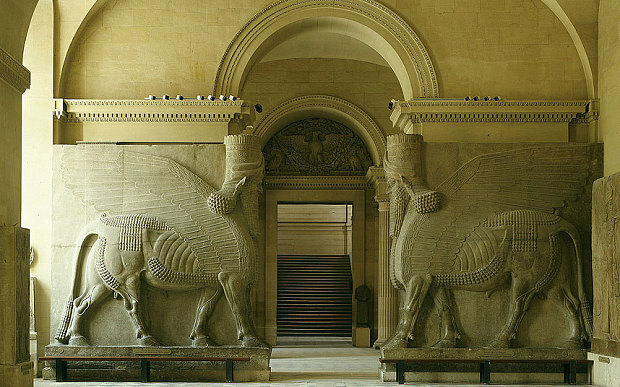 The Mosul Library, The ancient city of Nimrud, the Khorsabad Palace built between 717 and 706 B.C. and Hasra, a circular fortified city with double walls that became the capital of an early Arab kingdom. It was reported that ISIS had taken Palmyra, in Syria (above) but a later post says they have been forced out and Palmyra is safe. Some of the finest artifacts reside in Western museums. Everybody has criticized the British archeologists who snapped up so many treasures for depriving other nations of their heritage. Nobody really expected barbarians. After having lost hundreds of American soldiers in Ramadi and its environs since 2003, US efforts finally appeared to have paid off. AQI had been routed of the capital of its self-proclaimed caliphate, and would soon be routed out of the rest of the Sunni Triangle. Victory was in sight. It is all the more heartbreaking, therefore, to read now that the Islamic State—AQI’s successor organization—has seized the government center in Ramadi. Islamic State extremists detonated a series of suicide car bombs on Thursday to punch their way through fortifications protecting the government headquarters. Reports were that, after the headquarters fell, black-clad fanatics were going to door-to-door, executing tribal fighters who opposed their onslaught. Government security forces and many civilians were fleeing in panic. As Michael Auslin of the American Enterprise Institute points out, it’s as if the Marines, having taken Iwo Jima, had abandoned it and the Japanese had lowered the stars and stripes on Mount Suribachi. Obama has authorized fewer than 3,000 trainers who are confined to base and not allowed to recruit, train or arm Sunni tribesmen. Nor are they allowed to personally call in airstrikes. They have to depend on Iraqi security forces who are dominated by Iranian security forces to tell them what to bomb. In the guise of fighting ISIS, Iran is taking over most of Iraq. Obama has illusions of becoming partners with Iran, the world’s greatest terrorist-sponsoring state, and assigning Iran the task of managing the Middle East. AQs yet, he is utterly unable to explain to the American people just where the war effort stands and what he plans to do differently. The Arab states are begging for American leadership, but that seems not to be what Obama does. The West’s war against ISIS puts the U.S. and Europe tacitly on the side of Assad, the Iranians, and their joint Lebanese proxy Hezbollah for the simple reason that we’re all fighting ISIS at the same time while leaving one another alone. Tehran can hardly contain itself. “One of the world’s leading state sponsors of terrorism,” Weiss and Hassan write, “now presents itself as the last line of defense against terrorism.” The idea that a state sponsor of terrorism could ever be a reliable partner against international terrorism is ludicrous. This young Senator is going to be President of the United States one day. This episode of Uncommon Knowledge was published on April 8, 2015.